High-quality bike pedals are essential and give you the confidence you need to pedal up steep hills or rough terrain. On the other hand, having pedals that are worn out or low quality can result in a tougher ride or even worse, an accident. When shopping for bicycle pedals, the first thing you’ll need to consider is what kind of biking you’ll be doing. This will heavily influence the type of pedals you should buy. In some cases, you may want a hybrid pedal that can be used for both types of pedaling. This will come in handy if you’ll be biking on courses that have both flat and hilly stretches. 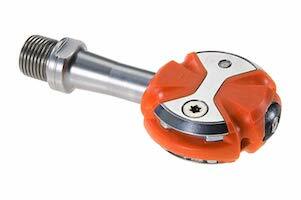 You’ll need to decide whether you want to use clipless pedals or platform pedals. Platform pedals are more versatile, while clipless pedals help to keep your feet securely on the pedals, even while bouncing or standing. 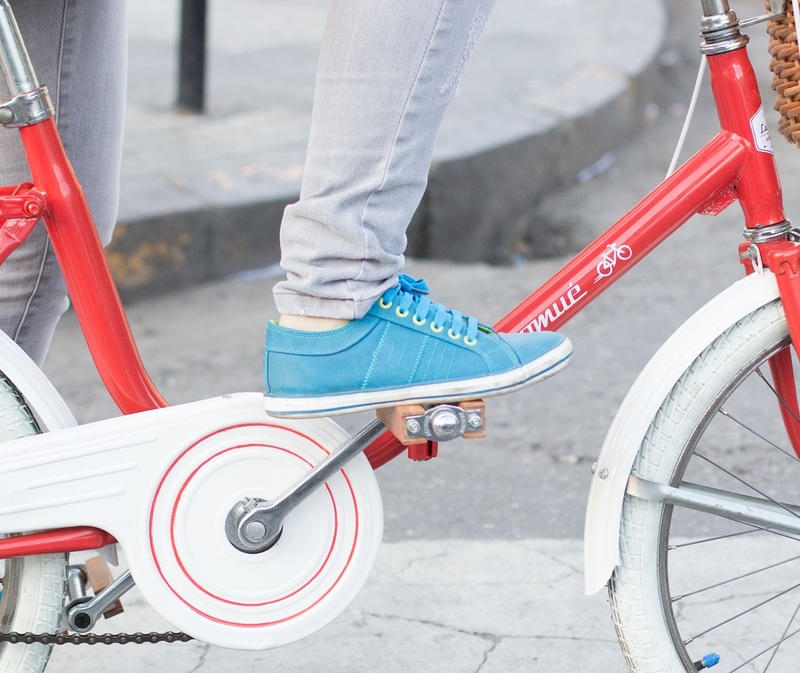 Platform pedals provide an even surface on both sides for your feet and can be used with any kind of biking shoe. Clipless pedals must be used with clipless shoes that you would mount small cleats on, and these cleats snap into clips which are spring-loaded on the pedal face. Still not sure whether you want clipless or platform pedals? Check out this article from CyclingAbout that discusses the advantages and disadvantages of clipless pedals. To some extent, your choice of mountain biking or road biking pedals will also determine whether you purchase pedals with a 2-hole cleat design or a 3-hole cleat design. 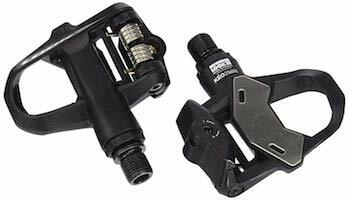 Assuming that you require clipless pedals for the control they provide, clipless mountain bike pedals generally feature cleats with the 2-hole design. The two holes are needed for the screws which attach the pedal cleat to the sole of compatible clipless shoes. The 3-hole design is offered on pedals which are larger and jut out farther from the sole of the clipless shoe. Typically, the 3-hole design is for road bikes. The main benefit of 2-hole systems is that the pedals and cleats on the shoes are smaller. The advantage of 3-hole systems is that they provide a more stable, larger platform that has a larger contact area between the cleat and the pedal. This encourages more power and performance. However, 3-hole systems are much larger, so walking in these cleats can be more of a challenge. If you’re thinking of buying clipless pedals, you’ll need clipless shoes. You can’t have one without the other. 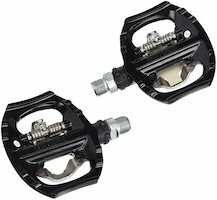 If you’ll be going clipless, you’ll need to buy a clipless shoe that’s compatible with the cleat style on your pedals. You can expect any compatible clipless shoe to be fairly stiff, so be sure the stiffness level is something you can tolerate while biking. You’ll also want to check on the release system: lateral vs. multi-directional. Essentially, the release system is how your clip your shoes in and out. A lateral release system will remove the cleats in only one way, while the multi-directional release allows you to disengage the cycle shoes from a variety of directions. While multi-directional release gives you more options in terms of how you get off the bike, it can be easier to accidentally unhook your shoes from the pedal. Alternatively, a lateral release system can be more secure in that you can only unhook your cleats from the pedal in one direction. This versatile bike pedal can be used as both a platform and a clipless pedal, and is great for going on either long biking treks or just a casual ride around town. They are compatible with virtually every kind of shoe made, and since they weigh just a little over 1 pound, they are very lightweight and easy to pedal. Available on Amazon for less than $50, this is a very affordable choice, and its adjustable float, entry, and release, make it a very easy pedal to work with when you want to customize your riding experience. This pedal is offered by the company which invented the clipless design in the 1980s, and it is considered to be one of their best-ever pedal offerings. It has a design which is highly aerodynamic and weighing only 1 pound, is also one of the lightest pedals on the market. Sold for around $100, this pedal has over-sized bearings and dual seals, and it is a pedal you should give strong consideration to if you’re looking for a top-of-the-line model. 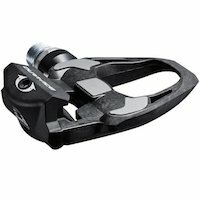 One of the most advanced pedals on the market, the SpeedPlay Zero offers a tremendous level of flexibility due to its unique approach which places both cleats and spring mechanisms on the shoe, as opposed to having the springs on the platform itself. 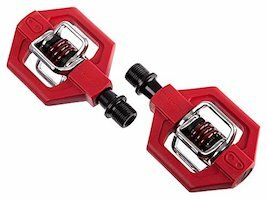 This symmetrical dual-sided pedal allows you to just step down into the cleat for ease of mounting and dismounting. This kind of quality comes at a price, however, with the SpeedPlay Zero available for around $250. These pedals feature a small platform so they can be used with regular shoes, and the pedals can be adapted for either mountain biking or road biking with a great deal of customization possible. The float-and-release angle are both adjustable to accommodate either type of biking environment. It features a 4-sided entry, which allows you to maintain an excellent connection. The pedals are also extremely affordable in the neighborhood of $50. The Dura-Ace 9100 features a broad platform area, so you won’t be troubled by hotspots during long, extended bike treks. It allows a high degree of flexibility with entry and release tension both being adjustable to suit the user. This is a lightweight option at around 1 pound total, and the price range is anywhere between $170 and $300.